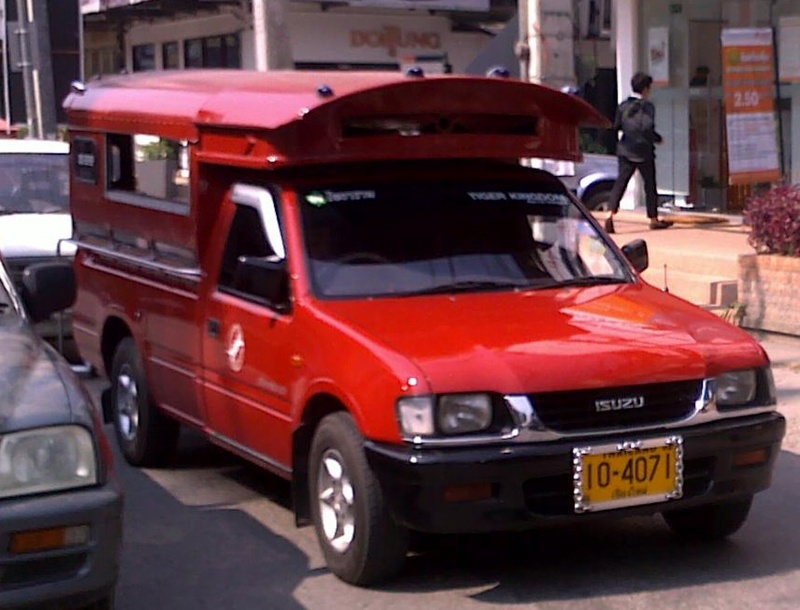 Chiang Mai: Standing by the main road facing traffic going into town, looking for the small red bus songthaew /song-tae-oo/. I see one coming in the distance. This time of day there’s always one nearby. It’ll go anywhere you want, the driver will fit you in, depending on the itinerary of the passengers already on board – so the journey may take a different route every time. That’s how it works; 20 baht (US: 69 cents) for a ride to nearly anywhere. There’s no designated route, no schedule, the songthaew just comes along and it’s a bit like jumping into a flowing river, holding on to a lifebelt and somehow it gets you there. I see the indicator light flashing, the songthaew stops, I tell the (lady) driver where I’m going, she says ok. I climb up two steps and get into the vehicle. Low headroom, sit down on the bench, smile at the other passengers, and fall into the mind-state of being taken away. It’s not anything, the only reason it’s there is that I linger with the idea of it. I can enter knowingly; I can consciously apply ‘knowing’ to the ‘self’ construct, applied knowing (not the theoretical kind), and the knowingness clears away the habituality. Thoughts that just wander for no reason are brought to an end by knowing that this is what it comes down to. ‘Every time I close the door on Reality, it comes in through the window.’ [Ashleigh Brilliant] All that remains is the emptiness of the moment; the sound of the engine, the vibration and the pressure of the bench I’m sitting on. There’s skin, hair; there are arms, legs, a head and eyes, ears, nose and tongue. I am a sensory-receptive organism. Just the warm air in my face and things rushing by. There’s identity but it’s nothing other than what it is; the personality flutters like a piece of cloth in the wind; coloured plumage of a bird and a sense of immensity occupies the entire background. I love the image of a songthaew as being like a flowing river! It makes me think that actually, whether we choose to acknowledge it or not – everything in life is the same way. We may make some choices as to the songtaew we elect, but ultimately we need to fit our journey in, or be fit in, around the needs and desires of other beings as well. Right, I know what you mean. Sitting in the back, head spinning around, trying to see out… where are we now? It only works in the known situation; the same set of journeys done a few times and not getting irretrievably lost. Select a nearby landmark, something easily seen (Thapae Gate) and the driver can tell you to jump off if you miss it. Then take a tuktuk from there on to your final destination? Life is wonderful. I just asked a good friend of mine via email whether consciousness = self or more or less and why not. And see, 2 hours later I read an answer from a teacher through the blog of another friend. Coincidences are interesting things… it’s not clear to me, though, what this means: ‘consciousness = self or more or less and why not’. Consciousness is not self, we agree on that? From my personal experience I don’t see consciousness as discontinuous. Except of course at death, where and when I cannot rely on personal experience to say anything (yet) :-). I remembered that the Buddha said that consciousness is not self. Then I have a problem that everything I can say about self I can also say about consciousness. But if I look at this quote, the context is restored. And than I see what it means. I see a lot of conscious processing going on during sleep. But I think we shouldn’t look that far and just see what Buddha said in the context of the teacher you quoted. Keep it simple seems also to be a good rule in this case. Perhaps another meaning has to do with the my in myself which points to identification. And so I think there is a lot lost in translations and I have the impression that the self and the consciousness I think about are different from what was said 2500 years ago. And I also see that reflected in the quote of Ajahn Buddhadasa. … I have the impression that knowledge resides in the memory of my mind, and that kind of memory is always past and not present …. I know what you mean. But rather than using words like memory and knowledge, I like to see it in terms of conscious experience – seeing it as an experiential thing. Otherwise there’s a tendency, maybe, to look at it like it’s an ‘object’ same as we do with everything else. (I have to go offline now, getting late here. I’ll check comments tomorrow) Thanks for an interesting exchange. Grateful for the exchange, but I will let everything trickle down slowly, … I have not much more to add. Thank you and have a good night of rest!